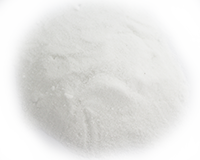 SOP®FORT Potassium Sulphate Soluble grade is High purity, full solubility in water and low pH, makes SOP®FORT the perfect source of a potassium in fertigation of greenhouse, hydroponics system, and open field, especially when there is no need for Nitrogen. SOP®FORT can be mixed with all water – soluble fertilizers, except soluble calcium fertilizers, and concentrated magnesium solutions. The high concentration of potassium with absence of N and P enable the correct quantity of potassium to be supply at any stage. 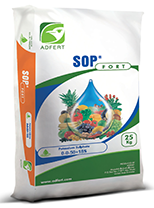 So we can be combined SOP®FORT with N, P or NP fertilizers according to plants requirements.